Our trip to Rome, that is. We're back at home now, trying to overcome jet lag and to conquer the mountain of laundry. 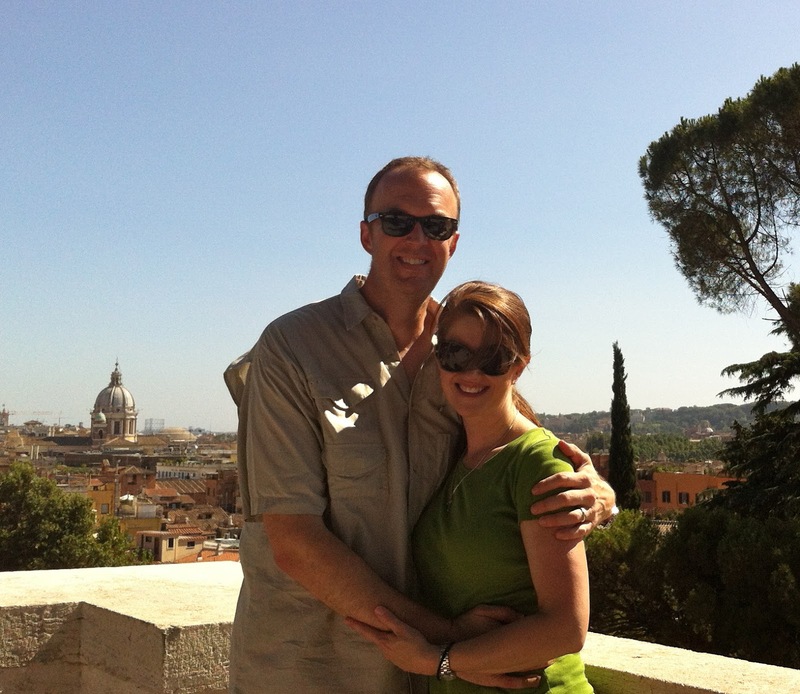 Here are just a few of my favorite photos from our time in Rome. A rare photo of Jack and me! We always seem to be the photo-takers. Will, Lee, and me overlooking the skyline. Jack and Lee at the Circus Maximus. Lee and me inside the Colosseum. Columns in the colonnade at St. Peter's. Musicians in Piazza Navona (they were playing the theme from The Godfather!). The famous status of the She-Wolf feeding Romulus and Remus. Lee was not that impressed with this statue. So what were my favorite things about Rome? Oh, boy. The wealth of art, to begin with. There are so many masterpieces, and you can get so close to them! Many of them are in the church buildings--works of Michelangelo, Bernini, Caravaggio, and so many others--it makes your head spin! And I love the way the ancient elements of the city are side-by-side with the modern and the contemporary. For instance, the best way to get to the Colosseum is to take the Metro (the subway). That Metro station is appropriately named "Colosseum"! A real highlight of our trip was visiting Will at work one day--at the U.S. Embassy to the Holy See. Wow! I'd never been inside an embassy before. We had to go through several layers of security, including surrendering our passports, turning in our cell phones, and having our belongings x-rayed. I had a bottle of water with me, and the security guard made me take a drink before he'd allow me to bring it into the building! But what a thrill it was to look around the Embassy and talk to some of the Foreign Service staff there. We are so excited for Will to have this opportunity. Lee has missed his big brother so much, and Will did an awesome job of showing his baby brother around the city. There's a special bond between those two, and it was such fun to watch them together. Thanks for letting me tell you about our trip! Are you doing anything special this summer? So glad you were able to see this beautiful city as a family and see where you son is working. These are awesome pictures! I'm glad you had a fun trip. Mi ha fatto molto piacere che ti sia piaciuta!! Wow, great photos and you and your family are so beautiful. Amazing photos, what a great trip! I think it would be so hard to come back home, I would want to stay and see more and more! 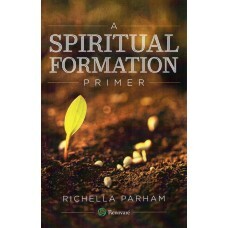 Looks absolutely wonderful, Richella. Such great family memories. I'm so glad you got to do this. What a wonderful experience for you and your boys! I know how special it is when your children become friends. Oh, Richella, the photos are magnificent. 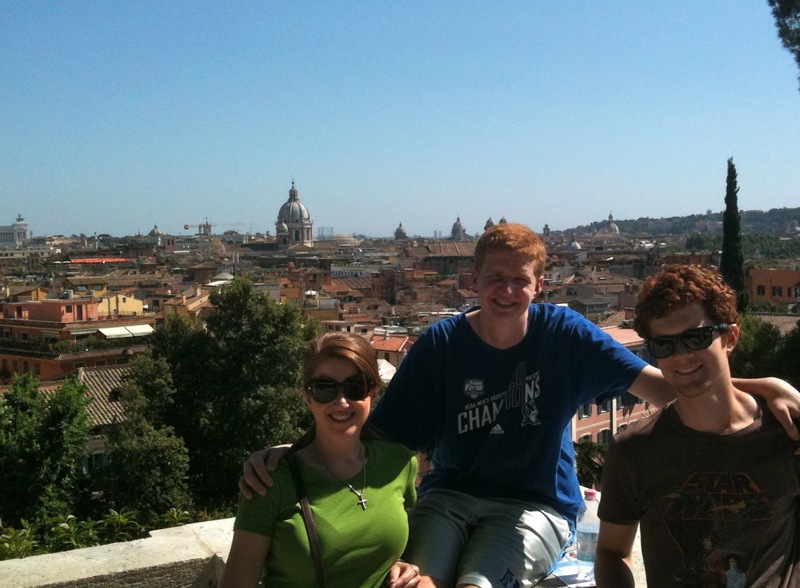 I am so happy that you, Jack and Lee were able to visit Will, Roma, the Vatican, and on and on. I adore the photo of you and Jack - so special. Glad you had safe travels - St. Christopher was watching over you. Hey, Richalla, great to hear from you! and girl, oh how lucky you are to get to go to Italy. It's been 20 years since I was there & I haven't forgotten it yet. Your pics brought back beautiful memories. I know you had a blast. HOw fun that your son is working at the embassy, that must be a dream come true for him. Hope to see you again one of these days. What a great trip you had! Being able to go into the US Embassy had to have been very exciting. I love the picture of you and Jack and hope you'll frame it. It's a great shot of both of you. What a great trip! I am so glad that you got to go. I know it was so good to see your son and for the brothers to get to be together too. And Wow..all of the sightseeing and the history...that must have been wonderful. What an amazing trip Richella!! Thanks for sharing your pictures with us.